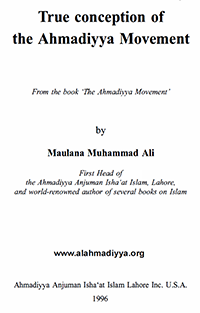 In this book, the author discusses the origins of the Ahmadiyya Movement and the role of its Founder, Hazrat Mirza Ghulam Ahmad of Qadian, in restoring the original beauty of Islam and enthusing the members of his Movement with the inspiration to peacefully spread Islam through propagation work. It also dispels several accusations against the Movement and its Founder. This book was originally published in Urdu as Chapter 4 of the book ‘Tahrik Ahmadiyya’ in December 1931. It was later published in English in ‘The Ahmadiyya Movement’ (English translation of ‘Tahrik Ahmadiyya’) in 1966. The first USA edition (with revisions) was published in 1996. Appendix 1: Was the Doctrine of Jihad Abrogated by the Founder? Appendix 2: Did the Founder make Slanderous Attack on Jesus and his Mother?